Damien (Jean-Pierre Bacri), a Chinese civilization professor, lives with his partner, Iva (Kristin Scott Thomas), a stage director, and their son Noé. The couple's relationship has drifted into routine that has drained it of love. Damien finds himself trapped one day by Iva, who orders him to ask his father, a senior member of the French Council of State, for help in preventing Zorica (Isabelle Carré), a woman Iva knows, from being deported. But Damien and his father don't get on and are barely ever in touch with each other. This dangerous mission throws Damien into a spiral that will turn his life upside down. Looking for Hortense [Cherchez Hortense] stars Kristin Scott Thomas (The English Patient, Sarah’s Key), Jean-Pierre Bacri (Look At Me) and Isabelle Carré (He Loves Me, He Loves Me Not) and was directed by Pascal Bonitzer, whose previous films as director include the 2003 Small Cuts [Petites coupures] and the 2008 The Great Alibi [Le grand alibi], and has chalked up an impressive fifty credits for screenplay and dialogue writing, including the 1991 La belle noiseuse and the 1998 Secret Defense for Jacques Rivette. 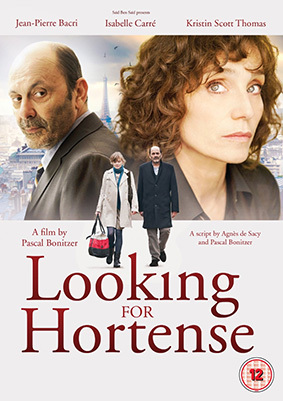 Looking for Hortense will be released on UK DVD on 2nd December 2013 by Arrow Films at the RRP of £19.99.